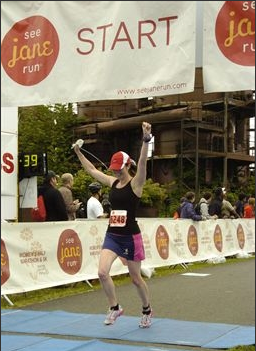 Talk about not training for a race, and yet getting some (sweet) unexpected results! My longest run after the marathon was only 6 miles with Kerrie on an early Friday morning. Even the pre-race dinner with running buddies didn't even phase me into the "half marathon" readiness state of mind. Completely oblivious until, well, the morning of the race. WOAH. No training. Ok, I'll just see how this goes then. The See Jane Expo was at the Westin Grand Ballroom, and it was very very very teeny. There were a small handful of vendors in attendance, but the event space was huge...a little wasted money. Oh well. Lesson learned there. Dinner at Il Fornaio was expensive but really fun. Our waiter kept suggesting things for me based on what I wanted (house red and penne with marinara)...he just made up my mind for me, I suppose. The stuff I got was pretty good! And since I'm not the biggest eater, he suggested the kids' penne pasta dish. Ha ha! It worked! Although I did eat a ton of the bread and vinegar/olive oil. Yum! Race morning Kerrie came by my house and I drove us up to Seattle to Chelsea's condo. I didn't have any bread for my usual PB&J sandwich, so I had two toasted waffles with PB minus the J. That wasn't the brightest idea. 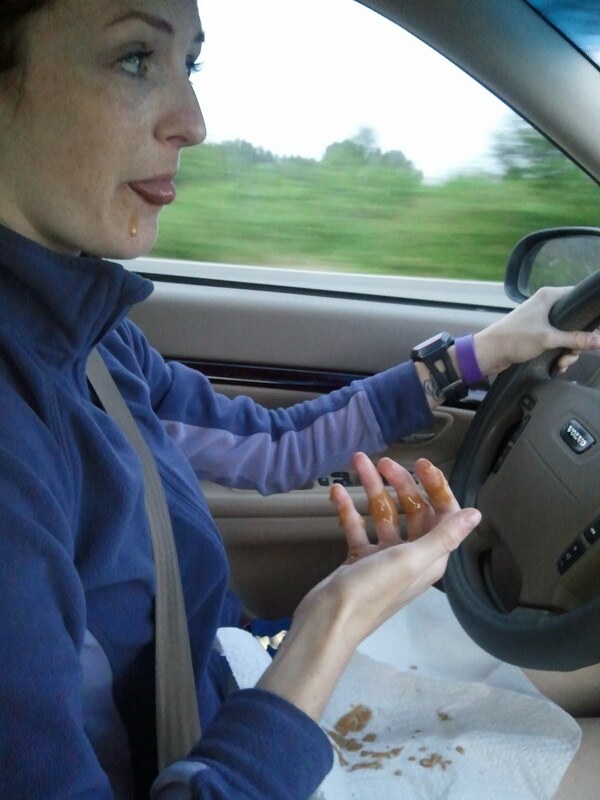 Melted PB was all OVER my hands and face as I was driving, much to Kerrie's delight. It was pretty funny, I admit, and delicious. Now isn't THAT attractive? Ha! Ballard is where I grew up, so it felt good to be in my old stomping grounds. We parked where we thought Chelsea's house was, but we were off by a block. "Consider it our warm-up," said Kerrie. As we walk the block, I'm breathing in the salty sea air deeply, which I've missed living in Kent. I run smack dab into a spiderweb as I inhaled. Proceed with the "it's-in-my-hair" dance and frantic brushing of my torso. Ick! Kerrie and I are kind of giddy and loopy. Not really realizing we're running a half marathon in an hour or so. Chelsea greets us and we go inside for a bit. I meet her really adorable doggie and we head out shortly after. 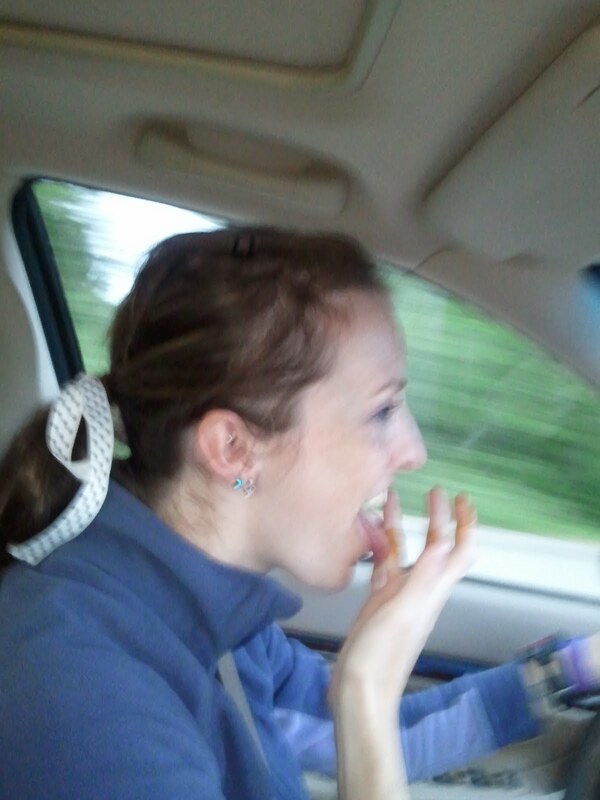 Chelsea's BF/Fiance M is awesome and drives us to the start. The rain is holding off, and it's a very cool morning. The crowd begins to grow and so do the porta potty lines. Talk about poor planning! There were seriously about 6 potties for over 2400 participants. Another lesson learned. Soon Tall Mom Mel and her Tall Sister Jayne arrived with Tall Mom's Muscle Man. Nervousness ensued. 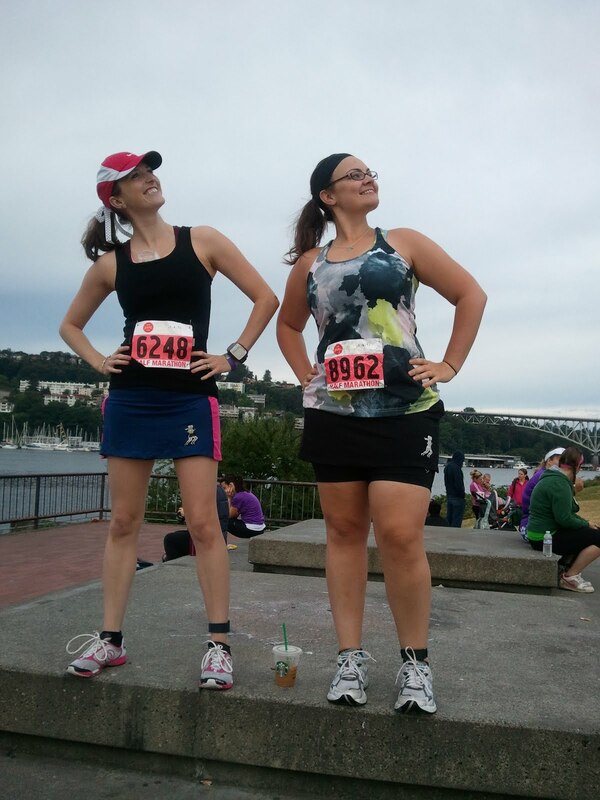 Chelsea was ready to rock her 1st half marathon with the help of Kerrie, and Jayne was going to be a first time half marathoner too with Mel's help. An exciting day was ahead for sure! We got some group pictures and just goofed off for a bit before the race. Laughter makes all (or most) of the anxiety melt away. Were we channeling Jill here? The race start was extremely chaotic and jumbled. Another hot mess. There weren't any waves or pace markers and so it was a bottleneck of runners scrambling for position. My goal for the race to was to keep a steady sub-9 pace if possible, and just have fun with it. The course was not on the road at the start. 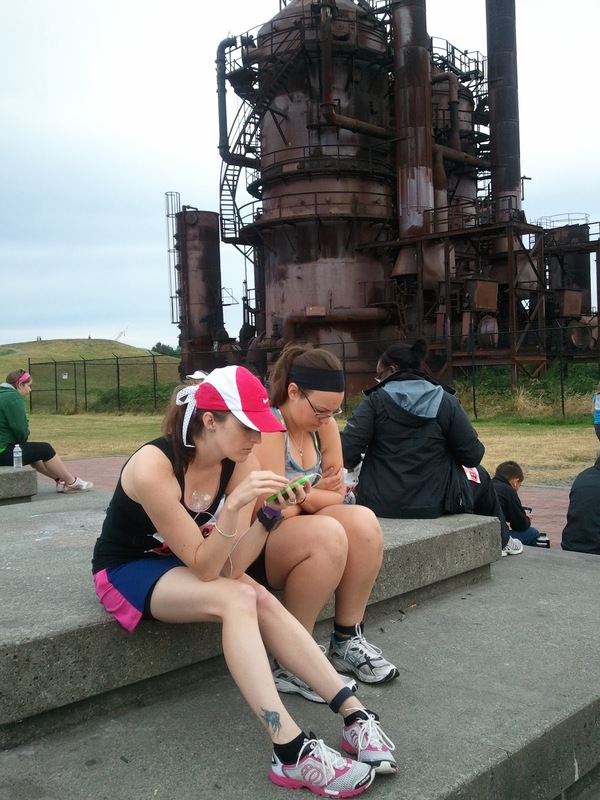 We ran on part of the small Burke-Gilman trail and sidewalks for an out-and-back along the Fremont cut. Being near the water was pretty sweet, as there was always something to look at. 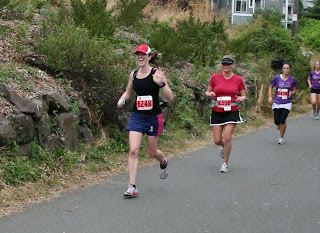 Plus it was cool seeing the faster women runners on the way back when I was running "out." My high school buddy Esther caught up to me and said HI, and I was surprised and happy to see her! "You're doing well!" I tell her. 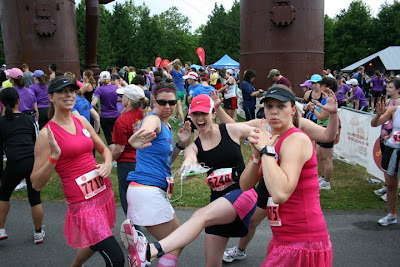 Apparently she recognized my hat, hair bow and running skirt (and the www.runzoerun.com tank was a good giveaway, too!). I'm feeling pretty good and keeping a good pace. On the way back I high five Diana, Mel & Jayne and cheer for Kerrie & Chelsea. I spot Mel's Muscle Man before he sees me at around mile 3.5--it must've been his bright yellow shirt!--and he snaps a quick pic of me as I pass by. 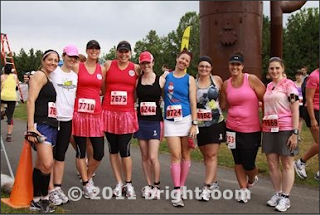 I'm running with a smaller group of women now, and one woman in yellow shorts is about the same pace as me, so I stick by her (slightly behind her) for a bit. The volunteers on the course were fantastic! There's this one woman spectating that I see twice already; I nickname her "The Ultimate Spectator" the rest of the race, as she makes another 5 or so appearances. I acknowledge her dedication and she tells me that her friend is running but isn't feeling well. What a great friend supporting her sick runner! Yay! I see a race photog and smile big as the course turns a sharp corner. Cheese! Then Miss Yellow Shorts drops her iPod Nano on the ground right in front of me and I scramble up and over her, jump/hop/skipping to avoid stepping on her iPod. Phew! Crisis averted! That would've SUCKED if I had broken her music source. Around the southend of Lake Union and around to the East the terrain was on a rocky road (unfortunately not the ice cream kind). At one point I stepped directly on a sharp rock on the neuroma sweet spot and ZING! I stop in my tracks with a yelp. Walked for a teeny bit before saying to myself "let's get this thing done." There were some hills and I powered through them as best as possible, despite the growing numbness in my feet (yeah, &*#(!^$*&@* FEET). Getting back to the Northend of the lake was a welcome occurrence. I had to count on my fingers how many miles were left (brain no workie). A little over 5! Yes! Of course we have to pass the finish line area at Gas Works for yet another out-and-back...UGH. 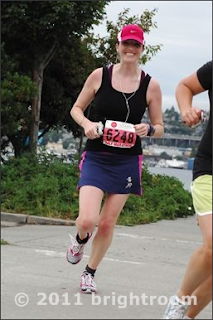 I didn't seem to mind as much as I thought though, as I was just having fun watching all the other runners pass in the other direction. My Clif Shot Bloks were keeping me satisfied and energized too. So far so good! 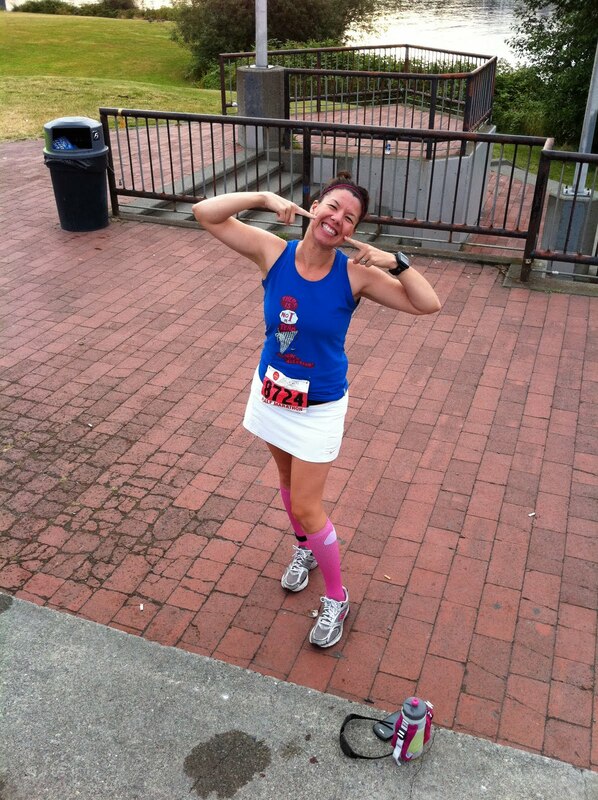 There's Muscle Man again, and he snaps an awesome pic of me (thanks Mel and MM!). 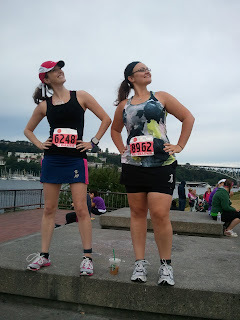 I found myself "stuck" behind some runners and started running their pace without noticing it. EEK, it was a 9:45 pace! "Don't feel bad for passing them" I think to myself. I didn't want to just zone out in a pace that was too comfortable, I wanted to bring it. After passing the 12 mile mark my stomach started turning. Oh goodness. I walked slowly through the last water stop hoping the tummy pain would subside. Luckily it did, and I realized looking at Gus that there was a slight possibility I could PR. Slight? I'll take it! I started picking up my pace. My game face displayed in full glory. "I'm going to PR this bee-yotch!" was my inner mantra. I rounded some corners and saw the entrance to the park. HECK YES! Pace picked up even more. The rolling Gas Works Park hills were on either side of the trail. Pace picked up EVEN MORE. Finish line in sight! Full on freaking sprint! I notice the clock is ticking in the 1:57 range. OMG!!! I think I did it! *Overall time was based on GUN time, which is stupid and unfair, as not everyone can cross the mat right after the gun sounded...especially in this jumbled/crazy start. ARGH! What amazing feat is next?!!! OMG. I can't believe you posted your recap first. Dude!!!! Yay! Congrats on the PR, I'm really bummed that all of their stats are overall since the start was such a cluster. 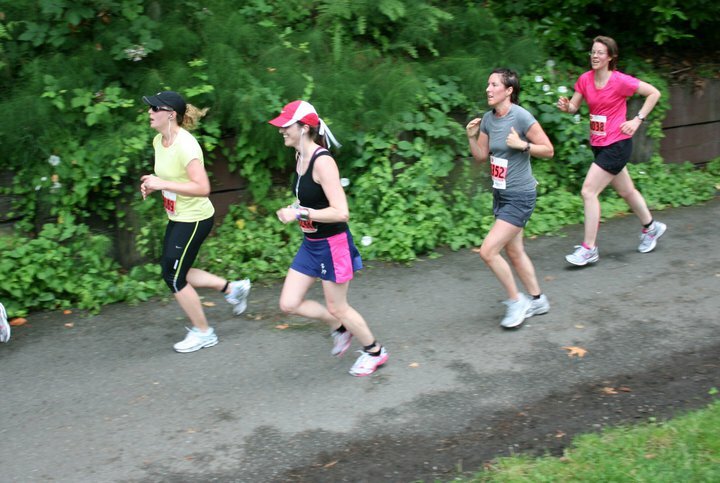 Those narrow out and backs were tough, I got stuck behind slower runners too and it was hard to get safely around them. Congrats! I think there is something to say for chilling a bit! I did the same before Seattle R N R and got a big surprise as well! Way to go! REST does a body good. Congrats on the awesome PR! Wow! Your PR is close to mine! Congrats on the great race so soon after the RNR! Nothing like an unexpected PR and minimal training! 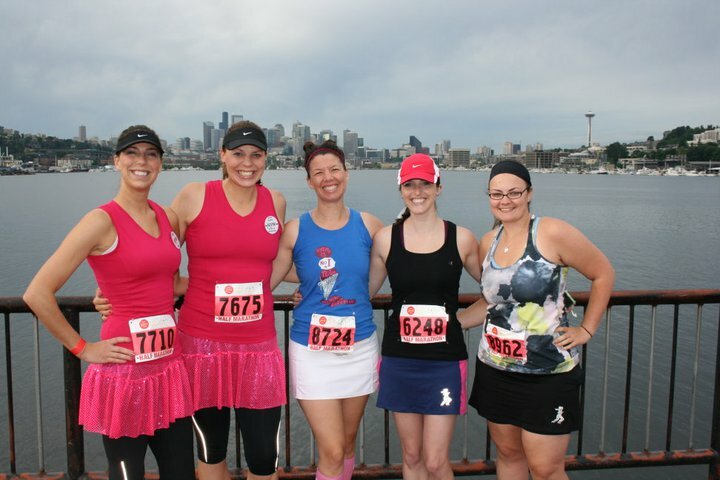 You really can capitalize on a marathon training cycle + race and it looks like you did! You killed it. Congrats!!! Hehe that's me on there!! WE are looking like studs... congrats again on the PR your rocked it! So proud of you and glad that my hubby was able to capture some great shots of you. I need some form training you look GREAT in all of your photos..
Soooo will you be pacing Kerrie for her Sub 2 at YGG?? Great job! I was pretty discouraged with the race and the narrowness of the trail. way to go girl! you killed it out there! great job on your new PR! your melting pb pictures cracked me up!! Congrats on your PR- that's GREAT! in applications Watches Replica and on-demand of Apple and Android smartphones. iOS and Android applications, simple, easy-to-understand Replica Rolex Watches graphical highlight week or the day of the month, at how much people sleep touches. The purpose of this way, to Designer handbags contribute to human happiness, in order to obtain a better understanding of its own, it is adapted to handbagreplica encouragement coach. And better sleep, more active lifestyle wide, simple, and is believed to UK Replica watches.